Historical and supernatural mashups can be found everywhere – books, films and yes, even comics. 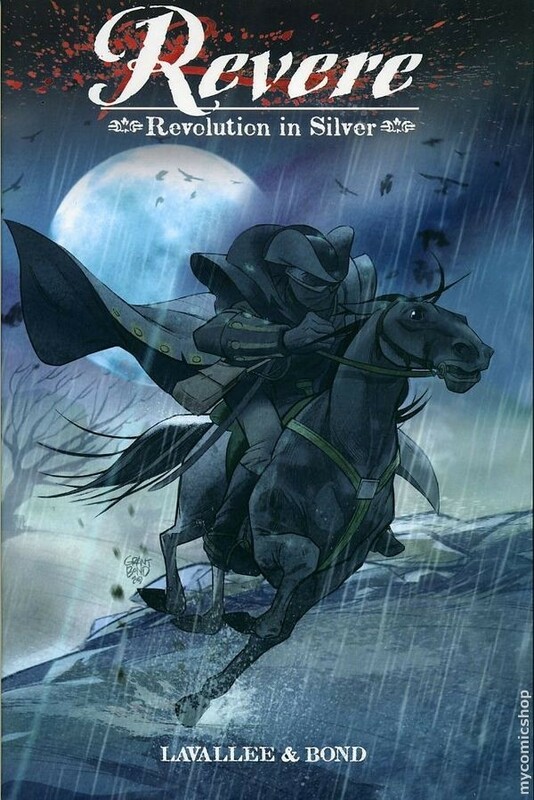 I recently checked out the first issue of a comic that combines werewolves with the American legend Paul Revere – Revere: Revolution in Silver. A silversmith and werewolves… clever clever. Check out my thoughts on the pair up below. I loved the artwork in this comic! Bond did an amazing job capturing the historical feel of the setting without making it feel too old and dull. I loved the style of art, the colors and the tone the work sets. Major points to the artist. The only thing I didn’t care for was the actual design of the werewolf, it just didn’t look very wolf-like to me. I prefer my werewolves to have some wolf characteristics. I didn’t read the entire comic, just the preview issue, and after that sneak peek I have no desire to read on. The story thus far was quite boring and slow moving. Other than cleverly making Revere a werewolf hunter, there wasn’t much else that was innovative or exciting. Also, the writing felt choppy to me, it didn’t flow smoothly at all. I was not impressed. Overall, I adored the artwork, but that was the only thing I liked about this comic. It’s not one I will continue reading. Have any of you read Revere: Revolution in Silver? If so, what did you think?